Governor Dannel P. Malloy and Lt. 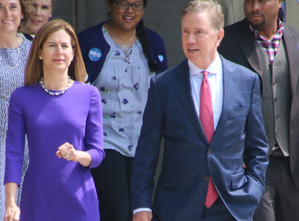 Governor Nancy Wyman released the following statements congratulating Ned Lamont and Susan Bysiewicz on their victory in the election for Governor and Lt. Governor of the State of Connecticut. Malloy said, “Elections offer a snapshot of the collective character as a state or nation. It’s our opportunity to affirm who we are and what we value. And today, Connecticut spoke loud and clear that we stand for fairness, inclusivity, and decency. That the politics of President Trump have no home here. That we resoundingly reject his politics of division, falsehoods, and empty promises. I offer my heartfelt congratulations to Governor-elect Ned Lamont and Lieutenant Governor-elect Susan Bysiewicz. Unquestionably, Connecticut has forward momentum, and of all the candidates on the ballot for these offices, they are, by far, the best suited to keep the state moving in the right direction. Under their leadership, Connecticut’s future remains bright. *Image courtesy Ned Lamont campaign website.